Pokemon consists of many components, and one of the most exciting is the anime. In the anime, the main character is Ash, a ten year old boy who's passionate about Pokemon. Professor Oak first gives him his Pokemon, which is the famous Pikachu. However, Pikachu isn't any of the three starters that you get in Pokemon Red and Blue. Gary and the other two kids got the original starters (Bulbasaur, Charmander, and Squirtle). Accompanied by his friends Misty and Brock (who are gym leaders in Red/Blue/Yellow), they go through many adventures and action, which make the anime something very exciting to watch. 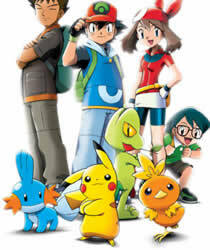 During the many episodes, different people come and join Ash, and some leave. There are tons of Nurse Joys and Officer Jennys everywhere they go, and the bad guys that always ruin everything is Team Rocket. Team Rocket is comprised of a teenage male named James, a teenage female named Jessie, and a talking Meowth. The trio appears in every single episode of Pokemon, and usually tries to steal Ash's Pikachu. However, they always fail to do so, and end up blasting off...again. The Pokemon anime isn't just a TV cartoon; there are also movies. For every season of the Pokemon TV show, there's a movie. The movies are all based on one or two Pokemon. These Pokemon usually have special values, for example, legendaries. The Pokemon in the movies usually talk human language. The movies will keep on coming out as long as the Pokemon TV show continues to air, and the Pokemon TV show will continue to air as long as new Pokemon games keep coming out. The main theme of the Pokemon anime is friendship. Nearly every episode of Pokemon and every Pokemon movie is about making and keeping friends. Friendship is strongly emphasized in Pokemon, even in the songs. It is important for fans to realize that Pokemon aren't tools for battling; they are our partners, our friends. They stand by us when we need them, and we stand by them when they need us. Ash's final goal is to become the greatest Pokemon master. To do that, he must go through intense training, travel great distances, earn badges, and gain experience. One day, Ash will succeed, and he'll become the greatest Pokemon trainer to ever live. TV Tokyo - The company that airs Pokemon in Japan. MediaNet - This is the company which distributes the Pokemon Anime throughout the world. ShowPro - The company that produces the Pokemon anime. 4Kids - The company that dubbs Pokemon in English. Toho Entertainment - Head of distribution of the Pokemon Movies.